Spurred by Revered Saint Dr. Gurmeet Ram Rahim Singh Ji Insan, Dera Sacha Sauda volunteers are actively participating in welfare activities at world level. Volunteers of Shah Satnam Ji Green ‘S’ Welfare Force Wing are lightening up myriad dark lives and giving them hope of life, with their deep devotion for Guruji and welfare activities. Following the footsteps of Guruji, on 4-6-2016, disciples from Perth, Australia, had organized a tree plantation drive at Port Kennedy to rejuvenate the earth. With their intense attempt, they planted 1000 trees in just 4:00 hours. 42 volunteers took part in this initiative and every one of them set a unique paragon of selfless zeal for entire mankind. The whole campaign was conducted with participation of COASTCARE AND FRIENDS of LAKE CLAREMONT. With a strong will and zest, they all have planted maximum number of trees, to finish the altogether major problem of Global Warming. The organizers were very thankful to Revered Guruji for raising such vital spark of humanity, which no one else have done till now. Salutations to His Excellency Guruji, who has induced boldness and courage to undertake welfare works at world level, among the volunteers! The exemplifying courage of these volunteers to help whole mankind make everlasting image in the eyes of people. Disciples proactively engage themselves in these ongoing selfless humanitarian tasks and making the world aware of welfare works of Dera Sacha Sauda and making everyone acquainted with the benevolence of Guruji. Green ‘S’ Welfare force Wing, Volunteers, Melbourne, Australia organized a Tree Plantation Camp Drive on 20th May 2016. This drive is organized with the help of Hobson Bays City Council, local government area in Melbourne, Victoria, Australia. With Grace of Revered Saint Dr. Gurmeet Ram Rahim Singh Ji Insan they planted about 1400 saplings. The Council’s members cheered-up the Volunteers for making the events successful in an organized and innovative manner. Volunteers are appreciated with a “Certificate of Excellence”. They are also proposed for partnering with Council’s future tree plantation and blood donation events. The Volunteers felt blessed to be able to contribute to their commitment and passion towards serving Humanity. This seems gratitude towards their Revered Guru Ji’s holy teachings. After the Drive was completed successfully, afternoon tea and lunch was provided by the Council members. In addition, “Langar” (charity kitchen) was arranged by Devotees for all the volunteers. The Langar menu involved Rice with curry, fruit salad and dessert, which was quite appreciated by other volunteers and the members of the Council. Also the Council member’s expressed gratitude for Revered Guru Ji for motivating the Volunteers to participate for Earth saving and Humanitarian activities on a regular basis. These Volunteers, no doubt are working for Humanity. It’s incredible that they do not take a single penny for conducting these drives.These people don’t plunge into such activities for the sake of money. But undoubtedly, they are endowed with such materialistic and spiritual happiness which they can never even imagine.And that is, true love which is given in abundance, by Almighty Lord, for helping His children to live a better and healthy life. The tradition of MEGA TREE PLANTATION is carried out by Dera Volunteers every year on the auspicious occasion of holy birthday of Guru Ji i.e. 15th August. Guruji always motivates these tree plantation campaigns and these are celebrated like a festival at Dera premises. 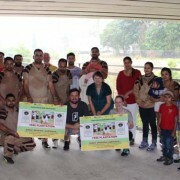 The main motive for these campaigns is to save earth from calamities caused due to Global Warming.With this true passion Dera Sacha Sauda has been able to mark its benevolence presence in Guinness World Records several times, each time breaking its own record of planting saplings. Guru Ji apart from planting Trees, also teaches to take care of the saplings as their own children until its proper growth. He himself takes care of each sapling every day by giving them water and a proper maintenance according to weather condition. The above sermons from Revered Guru Ji and HIS love and care are the sole factors motivating Dera Volunteers and billions others to continue service towards Humanity. 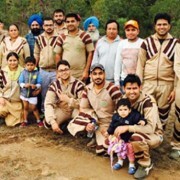 With Grace of Revered Saint Dr. Gurmeet Ram Rahim Singh Ji Insan, Shah Satnam Ji Green ‘S’ volunteers planted about 1800 saplings and donated 14 units of blood. Local government cheered-up the Volunteers for making the events successful in such a well organized and innovative manner. Volunteers are also appreciated with a “Certificate of Appreciation”. They are proposed for partnering with future tree plantation and blood donation events by Govt. The Volunteers felt blessed to be able to contribute to their commitment and passion towards serving Humanity. This shows gratitude towards their Revered Guru Ji’s holy teachings and his Grand success for the film “MSG 2”. Localities has expressed gratitude for Revered Guruji after witnessing such a passion for Humanity which also providing a message to society. Guruji motivates the Volunteers to participate for Earth saving and Humanitarian activities on a regular basis. Dera Sacha Sauda has registered several “Guinness World Records” in Tree Plantation and also for donating blood. With this pioneering effort blood donors of Dera Sacha Sauda are able to win the stunning title of “True Blood Pump”. Also Blood is supplied by Dera volunteers whenever and wherever required so that no one dies due to scarcity of blood. Dera Sacha Sauda happens to be the largest Blood donor to the Indian Military including Army, Navy and Air Force. A fixed 600-1000 units of blood is been supplied to Indian Defense on monthly basis. The Mega Tree Plantation drive is being organized every year by disciples on the pious birth occasion of Revered Saint i.e.15th August. Revered Saint himself inaugurates this campaign each year to motivate people to do the same and give their contribution in saving mother earth. Guruji motivates Volunteers across the Globe by conducting regular Blood Donation, Tree Plantation, Cleanliness and several other drives initiating them, Himself.125 Humanitarian welfare activities are conducted by Volunteers which have been initiated on the lines of women empowerment, water management, disaster management, battling superstitions, fighting diseases, connecting with virtues and almost everything that one can imagine. The zeal to serve humanity and mother earth among DSS Volunteers, Australia is admirable. DSS volunteers living here organized a tree plantation drive in Brisbane to aware people about the need of trees and to awake their inner consciousness to take care of planet they live in. About 400 Saplings were planted by the impassioned volunteers within few hours. Volunteers belief that clean areas, which can give birth to clean thoughts and thereby help in the formation of a healthy society, has been getting stronger and stronger with people joining Swachh Bharat Abhiyan all over India. The need for cleanliness has been widely accepted and efforts are being made to spread cleanliness across the Globe. It’s really heartening to see the small seed of selfless services sown by Revered Guru Ji has multiplied zillion times in the hearts of every Volunteer and is flourishing and spreading fragrance providing a relief everywhere. Passersby too expressed their heartfelt gratitude towards volunteers who serve selflessly in today’s time of Satan, and also pledged to take care of the neglected areas and keep them clean. Volunteers gave the credit of motivation and guidance for such welfare activities to Revered Saint Dr. Gurmeet Ram Rahim Singh Ji Insan whose guidelines are way to divinity and are power boosters for these volunteers. 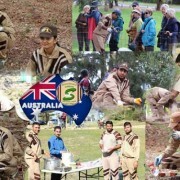 Shah Satnam Ji Green ‘S’ Welfare Force Wing Volunteers, Australia planted 5000 saplings in Plantation Day Drive. Shah Satnam Ji Green ‘S’ Welfare Force Wing Volunteers, Australia participated in Plantation Day organized by Grow West Melbourne at Rowsley, Victoria. The trees were planted by Volunteers at Ironbark region, 70km from Melbourne Central. The Council had about 5000 saplings to be planted and the Volunteers of Shah Satnam Ji Green ‘S’ Welfare Force Wing planted these saplings by initiating the drive at 9:30 am and the drive was wrapped up by 4 pm. It was a chilled morning with 2 deg. Temperature, when the Volunteers started the Campaign and as the day progressed the temperature rose marginally to 10 degrees. But freezing cold can never deter the enthusiasm of a Green ‘S’ Welfare Fore Wing member, who is determined to work his way to the destination, come what may. 85 Volunteers took part in the Drive which is highest till date. Lance, Event supervisor, was very happy to see the Volunteers again as he had met them in past Drives and was aware of their commitment and passion towards a healthy and green Planet. 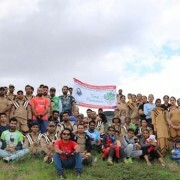 Emma, the head of the Council was also overjoyed to see The Shah Satnam Ji Green ‘S’ Volunteers again and this time in higher number than the last year which was 75, inspite of chilling temperature. After the Drive was completed successfully, afternoon tea and lunch was provided by the Council members. In addition, “Lungar” (charity kitchen) was arranged by sadh sangat (Devotees) for all the volunteers. The Lungar menu involved Rice with curry, fruit salad and dessert, which was quite appreciated by other volunteers and the members of the Council. These members also expressed their heartfelt gratitude towards Dera Sacha Sauda Volunteers, and their Master Saint Gurmeet Ram Rahim Singh Ji Insan, for igniting such passion amongst the Volunteers, towards Service towards Humanity. The Council members extended their invitation to the Volunteers for partnering in their future tree plantation events and making it successful as always. Their gratitude towards Revered Guru Ji falls short of words every-time and it can only be felt how thankful they are to the Volunteers, for regularly being part of Earth and cleanliness events. These Volunteers, no doubt are working for Humanity only and they do not take a single penny for conducting these drives, But they sure are paid much more than money, and that is, true love which is given in abundance, by Almighty Lord, for helping His children live a better and healthy life. The above sermons from Revered Guru Ji and his love and care are the sole and biggest factors motivating these Volunteers and billions others to continue service towards Humanity. 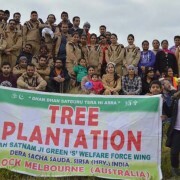 28th June, 2015 Melbourne, Australia: Volunteers of Shah Satnam Ji Green S Welfare Force Wing, the true Warriors of Humanity are constantly working towards painting and retaining the Planet’s Green Cover and towards this goal, two more tree plantation drives were conducted in Melbourne (Australia) on 28th June, 2015. 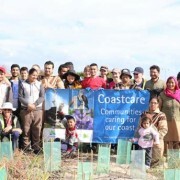 With the grace of Revered Saint Gurmeet Ram Rahim Singh Ji Insan 1000 trees were planted with Hobsons Bay City Council in Altona Coastal Park and 278 trees were planted with Friends of Skeleton Creek & Altona Bay Wetlands Inc. at Carshalton Court in Hoppers Crossing. It’s truly remarkable to see these Volunteers working day and night towards Humanity and towards betterment of the Planet. Cleanliness Drives, Tree Plantations, Blood donations, Awareness Campaigns, Anti Drug Addiction, post humous donation of Eyes, body, Skin (for acid attack Victims, skin is stored in Skin bank and used for skin grafting) and even ashes (one of the campaign that encourages people to donate the left over ashes, containing bones of deceased on which trees are planted, which in turn provides calcium, magnesium and many such minerals to Plants and source of happiness for the deceased near and dear ones) are just some of the 111 Welfare works initiated by Dera Sacha Sauda and the Volunteers of this organization are leaving no stone unturned in this mission Humanity. 14th June 2015, Melbourne The Shah Satnam Ji Green ‘S’ Welfare Force Wing Volunteers had a really long day with 4 separate Welfare activities to complete in about the same time. But these Volunteers with the blessings of revered Saint Gurmeet Ram Rahim Singh Ji Insan are always waiting for an opportunity to be of some service to Humanity and such days are like a boon to these warriors of Humanity. The first Activity conducted this day, was a blood donation Camp at 51-65 Clarke street, Southbank in Melbourne city for Australian Red Cross Blood Services. The donation was started at 10 am by 20 volunteers, of which 9 Volunteers donated whole blood and 11 donated Plasma. Red Cross really appreciated the Volunteers for helping them in saving lives on regular basis. The Volunteers at Melbourne have donated approx. 483 units of blood in last few years. At the same time, the Volunteers had another tree plantation with Hume City council at the End Of Horne St, Campbellfield Victoria and the timing was 10 am to 2 pm. It was a special plantation organised by council on the name of Shah Satnam Ji Green ‘S’ Welfare Force Wing. 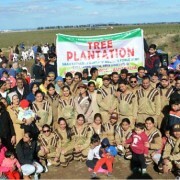 54 volunteers of Dera Sacha Sauda participated in the campaign and completed the plantation in just 1 and half hour. The Council head Melissa is so amazed at the speed of Volunteers, that she has given a new title to the Volunteers as ” A PLANTING MACHINE”. 1150 trees were planted in no time by the Volunteers. The Council was highly thankful for this great act by Shah Satnam Ji Green ‘S’ Welfare Force Wing Volunteers. At the same time around, 10 volunteers went to North Cumberland Rd, Pascoe vale to help Moreland Council with planting trees with a target of around 150 trees in 2 hrs and the Volunteers, the real Planting Machines finished it by 11:30 in just 1 and 1/2 hr. 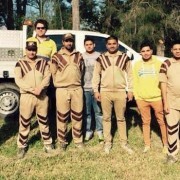 Another team of 20 Shah Satnam Ji Green ‘S’ Welfare Force Wing Members went to 5 Mile Creek, end of government Rd, Essendon and planted 100 trees in just 1 hr. The friends of Moonee Ponds Creek said they had never received that much help from anyone, as provided by the Volunteers of Dera Sacha Sauda. For them, planting these 100 trees used to be a struggle, but now their views had changed and from next time, they will be targeting more trees as nothing is impossible when this Welfare Force is there. This site is hosted by nina Franceschi Eason. All the sites were served with the Langar (dainty) of Kadi and Rice was served to everyone at the end, and the local people expressed their heartfelt gratitute for food and providing humanitarian services to save lives and make World a better place. In all,1400 trees were planted by 84 volunteers and 20 units blood donated by 20 Volunteers on this day at around 4 different places. The Volunteers are really thankful to their Master Saint Gurmeet Ram Rahim Singh Ji Insan, for inspiring and motivating them to provide such humanitarian services, touching millions of lives. 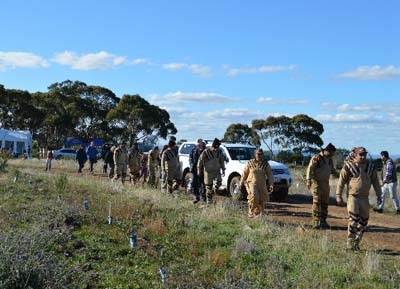 By the Grace of Reverend Saint Gurmeet Ram Rahim Singh Ji Insan and his pious guidance, the Volunteers of Dera Sacha Sauda and the members of its Shah Satnam Ji Green ‘S’ Welfare Force Wing carried out yet another plantation drive in Australia on Wednesday, May 20th, 2015. It is to be noted that these volunteers are quite regular in these drives there. Within a short span these volunteers along with the locals planted 400 saplings. The dedication and motivation of the volunteers of Shah Satnam Ji Green ‘S’ Welfare Force Wing mesmerized the officials and the locals. They were specially astonished by the quantum of welfare activities undertaken by Pitaji, Reverend Saint Gurmeet Ram Rahim Singh Ji Insan and his followers. Also, the recent acts of Disaster Management and Rehabilitation undertaken by the Green ‘S’ Welfare Force Wing at Nepal, for the earthquake victims overwhelmed them. They had all the praises for Reverend Guruji and Shah Satnam Ji Green ‘S’ Welfare Force Wing.